Last month I wrote a blog describing how I got into making stoles (you can read that here); this month, I want to say something about why I STILL make stoles. 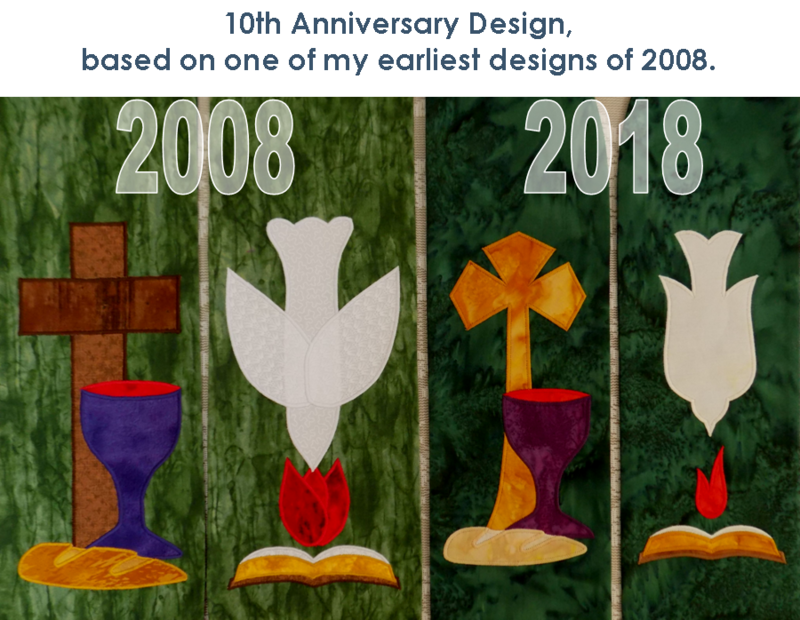 When I started in 2008, work was therapy, not just a job (and it was certainly not a paycheck the first few years), and designing stoles was a way of expressing love for God, not just creating part of a uniform. After the first year I realized that I really was able to provide a service to clergy who wanted something different from the usual factory manufactured stoles, Then one day in my second or third year a pastor referred to what I do as a ministry. I think that is when I realized that it was my calling, a vocation in which I could serve the body of Christ. I began to see how God had brought together the gifts of skill, life experience, and circumstance to bring glory to Himself through my need, for it was my need that pushed me to start making stoles. Since then, my understanding of liturgical art and its place in worship has grown and deepened. Worship should engage all the senses, and liturgical art is one way that can take place. Liturgical art should point to our Creator, Redeemer and Sustainer. Liturgical art can tell a story or start a conversation. Liturgical art vestments remind ministers of their sacred calling, while also setting them apart with a special kind of authority that comes from being a servant, a shepherd of God’s people. Recently I realized that by having stoles in hundreds of congregations each Sunday, my “voice” is amplified in worship, while I maintain relative obscurity. That must sound strange, but I have an explanation. Music is not a natural talent for me, but I love to sing. I have learned to read music, and I can usually carry a tune, but my vocal quality is very poor. I used to sing alto in a small choir, and never could sing loudly enough to suit the choir director, maybe because I was right there in front of the whole congregation. Liturgical art of the visual kind is a “key” I can “sing” in clearly without being noticed, in hundreds of congregations for hours on Sunday morning. God has made us to enjoy and worship Him with everything that we are, for eternity. The closer I get to eternity, the more exciting that is. There may come a time before then, for physical reasons, that I will have to pause this means of worship, but it is for worship and God’s glory and to fulfill God’s calling that I STILL make stoles. When the risen saints rule with Jesus Christ, I hope that I will have more liturgical art to create for the worship of our Lord.